There’s an outbuild into the sea at North Shore just past Gynn Square near Bispham. It’s marked by the Cliff Lift down to the lower level… it was once Blackpool North Shore Boating Pool. Whether you walk past on foot or drive along the promenade you can’t fail to notice the Cabin Lift. It’s a stand-out building, teetering for nigh on a century against the edge of the shore. 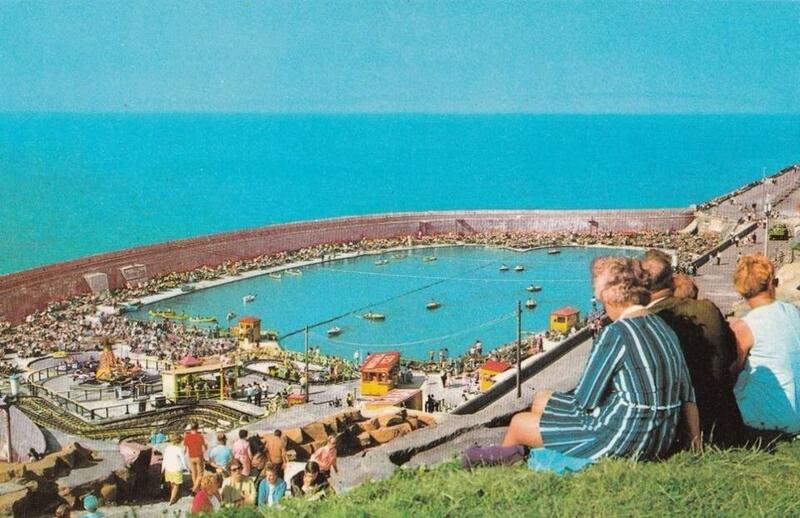 It once ferried holiday makers up and down to save them the steep climb from the upper to lower promenade. The Cabin Lift was built in 1930 and made a Grade 2 Listed Building on 8 March 2010. Externally it looks much the same as it did in its heyday, albeit with a few modifications. It’s accessed by a little bridge from the upper promenade. There was once a front portion to the building which housed a waiting room. It was demolished some time ago. There were once public toilets built into the artificial cliffs below the lift. They were refitted in the 1970’s, but are now out of use. Below the Cliffs is a huge curved outbuild with a high concrete wall which stretches out into the sea. It was originally the Boating Pool. After the Boating Pool closed it lay redundant for some years. 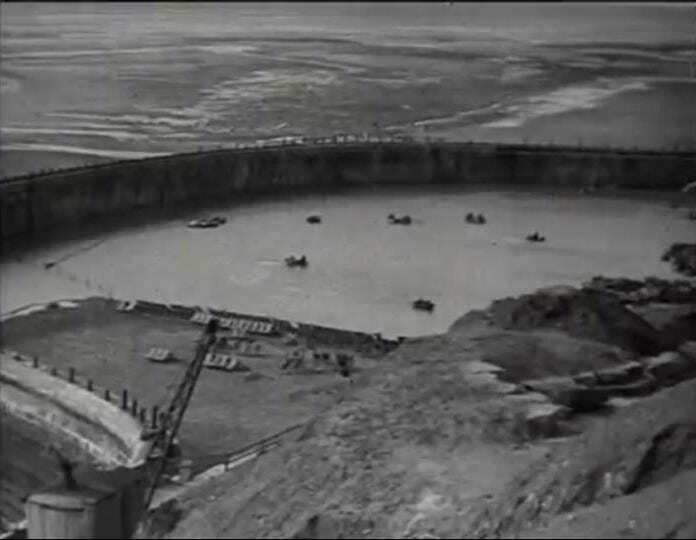 It then became a storage area for spoil and rubble during the sea defence works. 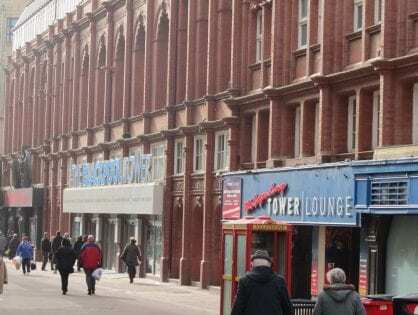 In 2003 Blackpool Council put out a plea for a private business to take the land and find a good use for it. 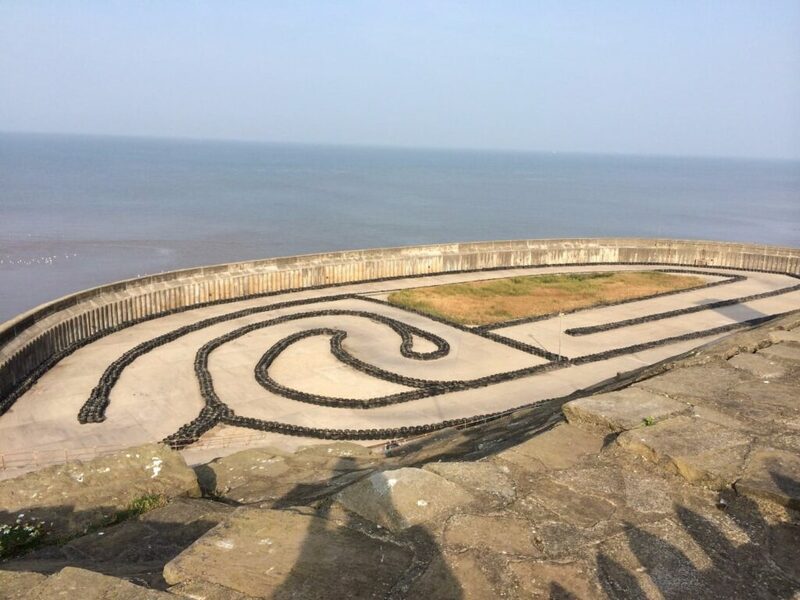 It’s now a karting track, fitted out with circuits defined by old car tyres. On a calm, sunny day, Blackpool North Shore is a beautiful spot. The height of the promenade makes for amazing views. However, in bad weather on stormy days it can be horrendous. It is such an exposed spot, and feels the full force of the Irish Sea with nothing to protect it. There isn’t even a beach to absorb any of the energy of the waves. 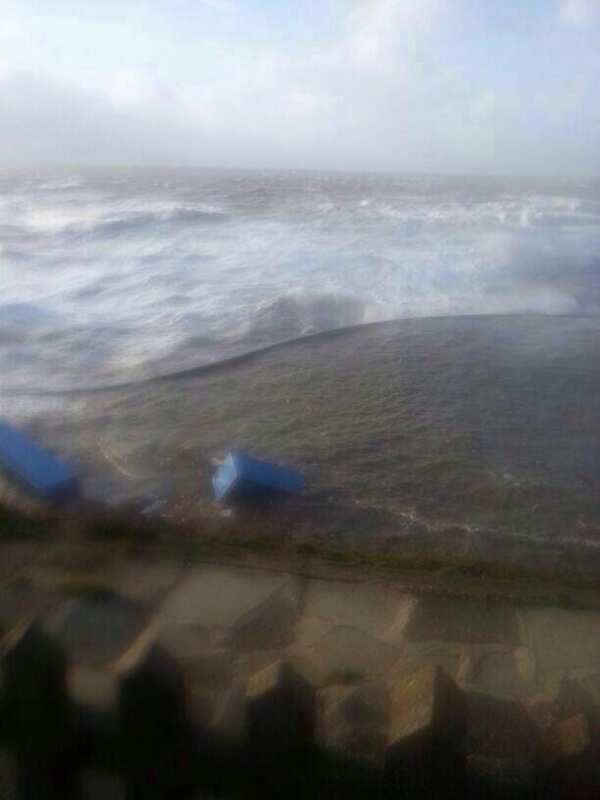 Each one bashes at full speed against the concrete sea wall, creating overtopping and spray. The next photo is North Shore Boating Pool, full to the brim with sea water! The calmer water in the centre of shot is the inside of the sea wall. The blue objects are shipping containers, floating around. This photo is by David Wall. This can happen at any time of year with the right combination of tide height, wind strength and direction. Not just in winter! David Wall’s photo of Blackpool North Shore Boating Pool after a winter storm. 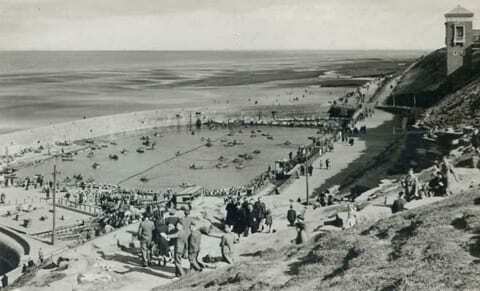 David Wall shared the photos below on Bispham Past, and this history about when it was built. 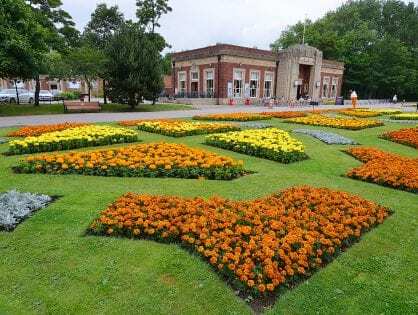 The boating pool was constructed by the Council in the mid 1920’s at the same time as the sea defences were pushed through from the Gynn. The rockery was built behind it to stabilise the very steep eroding cliff. In 1930 the lift was constructed, taking passengers to three levels. It was designed by J C Robinson and is now a grade two listed building. Its interior, including the lift mechanism, was renovated in the late 1990’s. Then the council reopened it and employed lift operators for two seasons. It had a small charge but was used so little that they withdrew the funding for it. 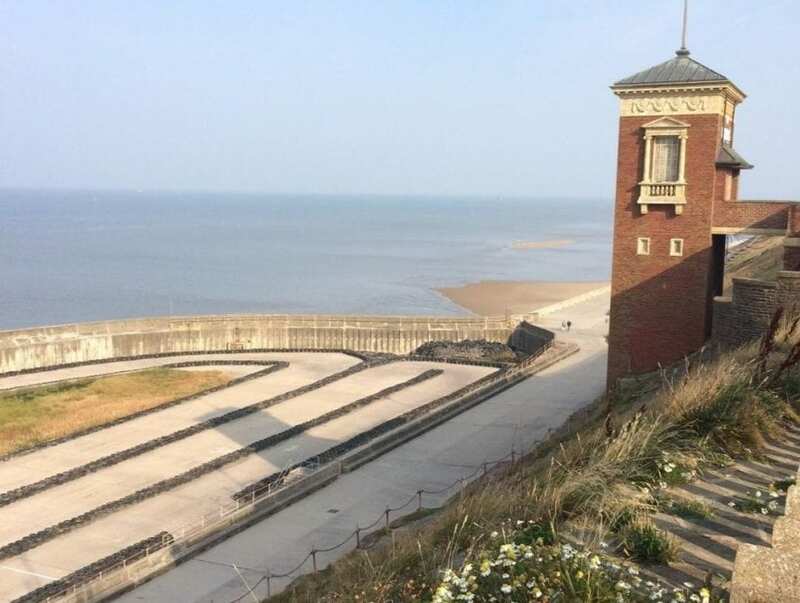 In the mid nineties, the whole of the boating pool was reconstructed and strengthened along with the sea defences from Bispham to the Gynn. A number of operators have tried to make a success of it since it’s decline in the 1970’s. However plummeting visitor numbers doomed each initiative to failure.  One reader remembers there being a lift attendant at Blackpool North Shore Boating Pool, to see you safely up and down. There was a small charge to use the leg-saving lift. As you went up and down in the lift you passed painted faces installed in cut-outs in the sides of the lift! 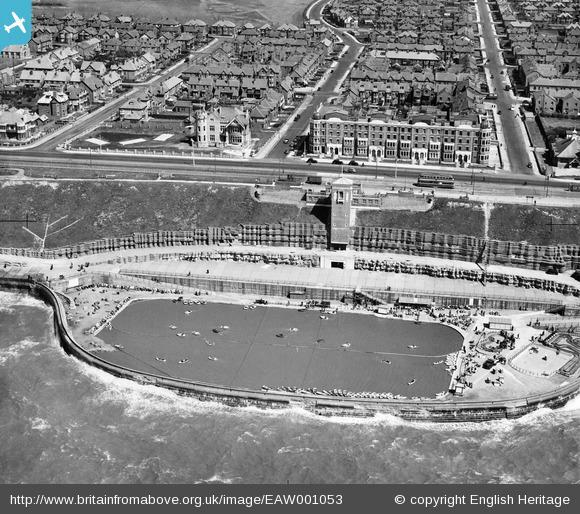 This fantastic photo (below) of the Boating Pool at Blackpool in 1946 is from the Britain from Above website. 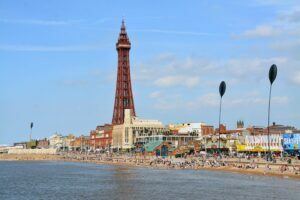 It’s well worth a look if you’re interested in Blackpool’s history. 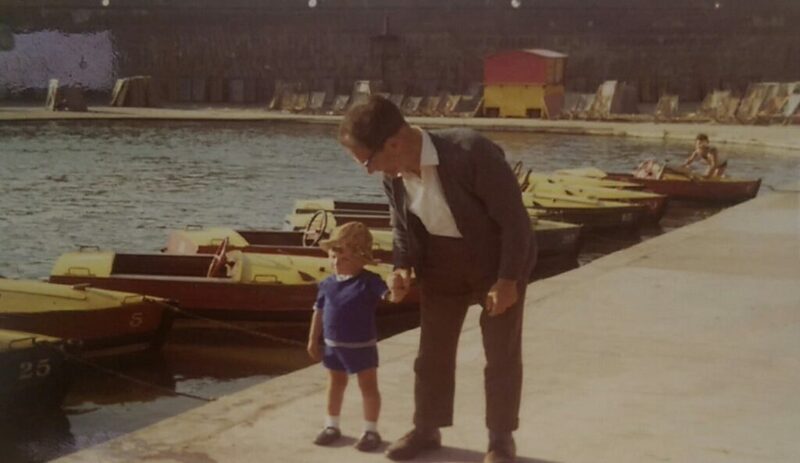 David Coulson got in touch to share this photo and his memories of the boating pool in the early 1970’s. David told us: “This photo was taken in pre-digital camera days. It was my Dad Thomas and I and the photo was taken by my mam Greta. We’re originally from the North East (Darlington) but I now live in Darwen, Lancs. “My Mam is no longer with us and my Dad is now elderly, but it would mean a lot if you could post it. I’m sure it will bring back so many fond memories to a lot of folks. 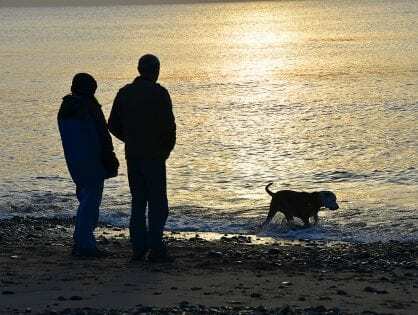 “I still travel back practically every week, along the same A66 that we used to travel in my Dad’s beloved old 3-wheeler van. 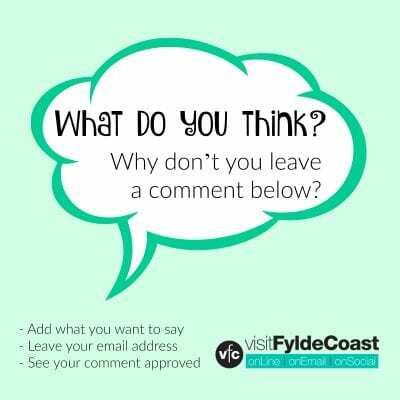 Anecdotes shared on the Live Blackpool Facebook page remember that the boating pool was a favourite spot for crabbing. Apparently it was full of the little nippers! A piece of string with a mussel on the end was perfect for catching them with. It’s a spot which brings back happy childhood memories for many of you, of fun days in the sunshine with an ice cream in the 60s and 70s. In the early 80s small children’s rides were later introduced, including little aeroplanes and a twisty train. 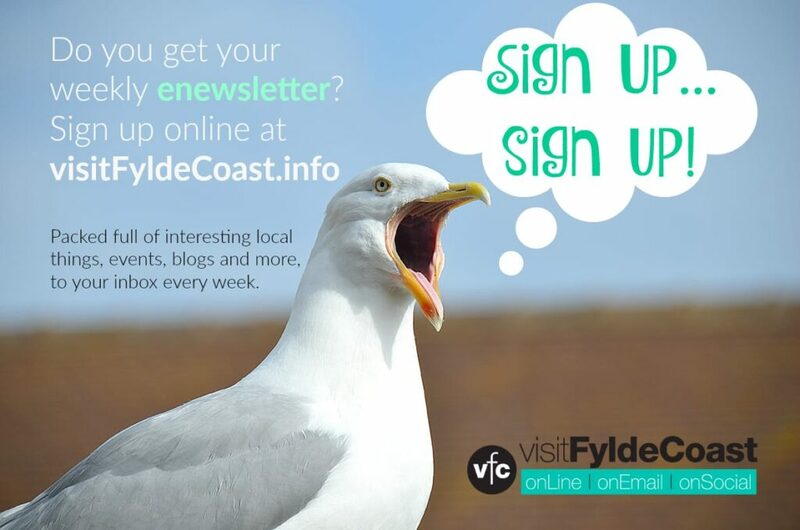 Thanks to the readers of the Blackpool’s Past and Bispham Past and Present Facebook groups for their memories and photographs.